to our 2014 sponsors, donors and supporters! Don’t miss the special broadcast of the entire Prince Lot Hula Festival on Olelo Channel 53! Shows will air August 14 through September 29. Click here to see full schedule. Moanalua Gardens Foundation (MGF) has announced that “Kila Kila O Moanalua…Majestic is Moanalua,” the 37th Annual Prince Lot Hula Festival, drew an estimated 13,000 persons during the daylong event held on Saturday, July 19, 2014. The largest non-competitive hula event in Hawai‘i, the festival honors Prince Lot Kapuāiwa who helped to revive the hula by staging pā`ina (parties) at his summer home in Moanalua, now located at the gardens. “The festival would not have been possible without support from the Hawai‘i Tourism Authority, The National Endowment for the Arts, the Office of Hawaiian Affairs, the State Foundation on Culture and the Arts, and our sponsors and donors” said Alika Jamile, Executive Director and President of MGF, presenter of the festival. “Thanks to our many sponsors and donors, the festival continues to surpass our expectations and each year increases in both popularity and prominence as our residents and visitors discover the beauty of hula performed in spectacular Moanalua Gardens,” stated Jamile. 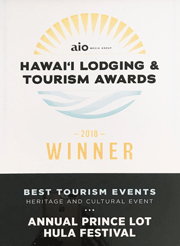 “It was especially heartwarming this year to see so many people turn out as we honored five outstanding kumu hula with our first ever Malia Kau Award,” he continued. supporters include the National Endowment for the Arts, State Foundation on Culture and the Arts, Kamehameha Schools/Kamehameha Publishing, Hawaiian Host, Capital One 360, Hawaiian Airlines, `Ōlelo Community Media, Kaimana Ventures LLC, Hawai`i Visitors and Convention Bureau, O`ahu Visitors Bureau, Honolulu Star Advertiser, MidWeek, City and County of Honolulu, Leonard’s Bakery, Matson Navigation, Pasha Hawai`i Transport Lines, R.M. Towill Foundation, Servco Foundation, The Queen`s Medical Center and other businesses, sponsors and donors. Opening ceremonies paid tribute to Malia Kau awardees Na Kumu Hula Kaha`i Topolinski, Leina`ala Kalama Heine, Vicky Holt Takamine, Robert Uluwehi Cazimero, and Wayne Chang, all who have made immense contributions to the Prince Lot Hula Festival and our Hawaiian culture. Their haumana honored them with a special ho`okupu while composer and Kumu Hula Manu Boyd created and performed a special mele for them. Other festival highlights included tatoo workshops, cultural demonstrations by noted practitioners, handcrafters fair, a morning concert by the Kamehameha Alumni Glee Club and a noon concert by the Royal Hawaiian Band. Founded in 1978, the Prince Lot Hula Festival has been designated a signature cultural event by the Hawai‘i Tourism Authority (HTA). The festival’s goal is to preserve and perpetuate the culture, language and hula traditions of Hawai‘i. 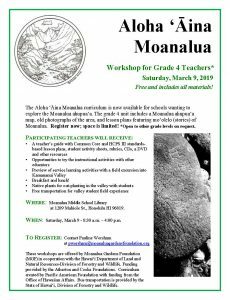 Established in 1970, Moanalua Gardens Foundation (MGF) is committed to preserving and perpetuating the precious cultural and natural resources of our islands through education, celebration and stewardship of Kamananui Valley and Moanalua Gardens. For more information about MGF or to become a member, please visit MGF’s website at www.moanaluagardensfoundation.org or call 808.839.5334. 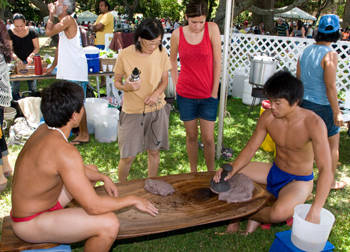 Join us at Moanalua Gardens for the 2015 festival on Saturday, July 18, 2015. “Kila Kila O Moanalua…Majestic is Moanalua,” is the theme of the 37th Annual Prince Lot Hula Festival which will take place at spectacular Moanalua Gardens on Saturday, July 19, 2014, from 9 a.m. to 4 p.m, announced Moanalua Gardens Foundation (MGF), the festival’s presenter. The largest non-competitive hula event in Hawai‘i, the festival is held each year to honor Prince Lot Kapuāiwa who reprised the once forbidden hula in the district of Moanalua.An historic and cultural treasure, Moanalua Gardens is one of the most beautiful places in Honolulu on the island of O`ahu. Once a botanical garden, it is home to famous structures and rare trees, including the famous “Hitachi” tree.“Kila Kila O Moanalua” is a most fitting theme for this year’s festival because it talks about the grandeur of Moanalua which still amazes us today,” said Alika Jamile, MGF Executive Director and President. “The mele (song) was composed by Pililua after Samuel Mills Damon sank the first well in Moanalua and piped water to the gardens nourishing the ‘āina (land), our people, trees and flowers,” Jamile stated. Opening the 2014 festival will be noted Kumu Hula Robert Cazimero followed by an impressive line-up of premier hālau hula (hula groups) who will perform both kāhiko (ancient) and ‘auana (contemporary) hula. 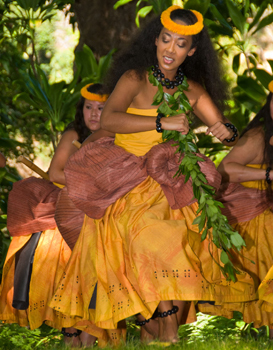 Dancers will perform on one of the few remaining pā hula (hula mounds) in Hawai`i.Local food and refreshments will be available for purchase throughout the day. 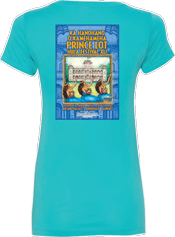 Limited edition tee shirts and a souvenir button will be on sale. Proceeds from these merchandise sales will help cover the costs of the festival.There is no charge to attend the festival, however, a button donation to MGF is requested to raise funds to support the event.The public, and visitors, are welcome and encouraged to bring their beach chairs and mats and enjoy the fun, food and festivities under the shady monkeypod trees of Moanalua Gardens. No commercial photography is allowed. 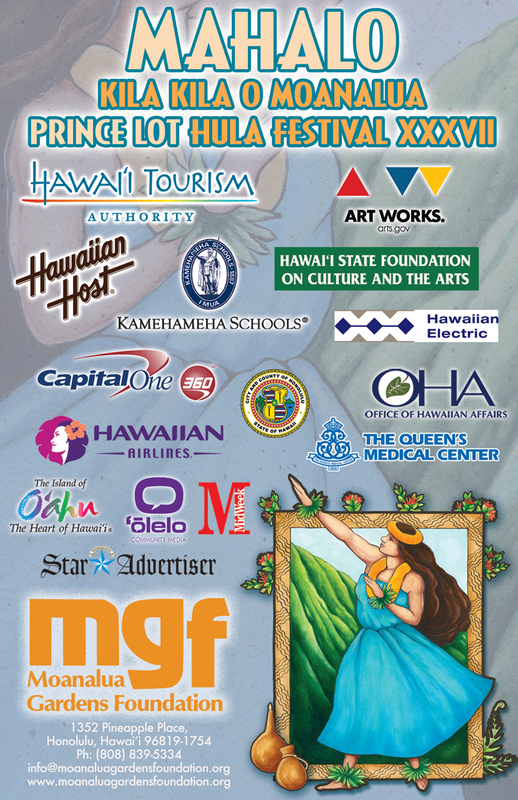 Festival sponsors and supporters include the Hawaii Tourism Authority, State Foundation on Culture and the Arts, the Office of Hawaiian Affairs, the City and County of Honolulu, Hawaiian Electric, Hawaiian Host and The Queen’s Medical Center, the National Endowment for the Arts, Kamehameha Schools, Capital One 360, Hawaiian Airlines, Servco and RM Towill Foundations, Pasha Hawai‘i, Matson Navigation, First Hawaiian Bank, Hawai‘i Visitors and Convention Bureau, O‘ahu Visitors Bureau, the Honolulu Star Advertiser, MidWeek, ‘Ōlelo Community Media and others. Named in memory of King Kamehameha V, Prince Lot, the festival was founded in 1978 by MGF and now attracts up to 10,000 residents and visitors each year. Moanalua was a favorite recreation spot for Prince Lot, who is credited with reviving the hula in the district of Moanalua. His summer cottage can be found on the gardens’ grounds. Participating hālau and a festival performance schedule will be announced at a later date. For more information about MGF, please visit MGF’s website at www.moanaluagardensfoundation.org or call 808.839.5334.A non-profit organization founded in 1970, Moanalua Gardens Foundation (MGF) is committed to preserving and perpetuating the native culture, environment, and people of Hawai’i through education, celebration and stewardship of Kamananui Valley and Moanalua Gardens. MGF depends upon grants and donations to cover festival costs. 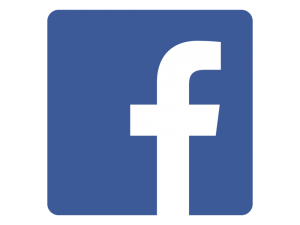 To make a donation or become a member please visit www.moanaluagardensfoundation.org .Like us on facebook by clicking here. Shop at Amazon to Support Moanalua Gardens Foundation! Click Amazon smile to learn more. Partner Level ($150) & Above will receive a FREE T-Shirt. Click button below to join. Stay at one of these great hotels and support MGF while receiving great rates! © 2017 Moanalua Gardens Foundation • All rights reserved. This webpage, photos and contents may not be copied or reproduced in any form without the written permission of Moanalua Gardens Foundation. Moanalua Gardens Park Hours: Daily 7:30 am to Sunset.